Presented at the discussion panel on The Daodejing and the Global Impact of Chinese Philosophy at the XXIV World Congress of Philosophy in Beijing, China on August 14, 2018. I offer for our discussion two very different ways of engaging the Daodejing: the Way of a lifetime and the Way of a day. I will illustrate the Way of a lifetime by sketching for you the life story of Professor Antanas Andrijauskas of Lithuania. But I will then focus on my own personal experience of how Daoism for a day makes sense in a culture of independent thinkers. I will show that the Way of a day makes for a fundamentally different reading of the Daodejing. 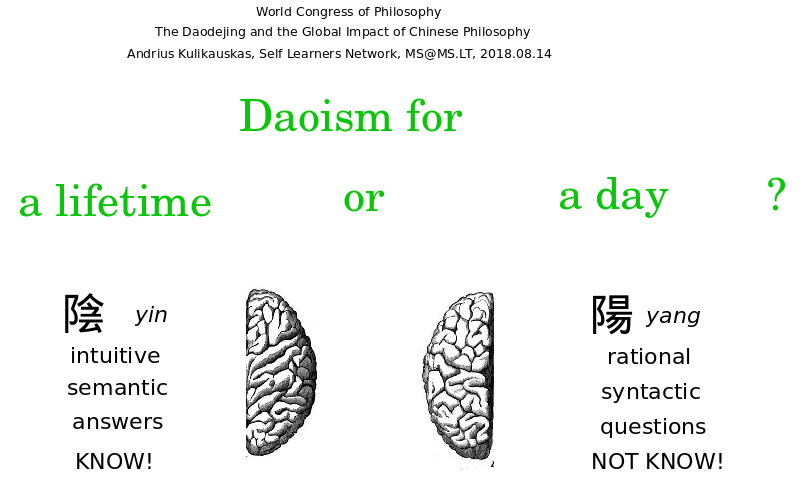 I do not want to presume Daoism but rather, as a scientist, I am very open to learning from Daoism and Chinese philosophy, more broadly, if it can help make sense of findings or contribute new ideas. For example, for many years I have been highly skeptical of the yin and yang distinction. But recently I have thought a lot about duality as the basis for logic. Logical propositions can always be phrased in terms of what we know but also in terms of what we don't know. This suggests the distinction that psychologists Kahneman and Tversky make between two minds: a fast-thinking, intuitive, semantic, unconscious System 1 which always knows precisely one right answer, and a slow-thinking, rational, syntactic, conscious System 2 which does not know anything but rather raises questions that may require two or three or four answers. Logic allows and thinking requires the regular maintenance of a perfect balance between these two minds. It is quite plausible that the two hemispheres of the brain function as advocates for these two systems so that they can achieve that balance. Similarly, in social interactions, it would be understandably useful to have available two such stereotypical forms of thinking - intuitive and rational - which around the world are often attributed to women and men, by default. If this is what yin and yang refer to, then I find them empirical and not at all mystical. I will appeal to them in distinguishing the unconscious Way of a lifetime and the conscious Way of a day. Andrijauskas's student Tautvydas Vėželis typifies a Lithuanian understanding of Daoism as a current of thought when he writes, "Daoism for me personally is first and foremost a respect for nature and all forms of life, but also avoiding hierarchies, being mindful of those who are different, staying away from glitter and pomposity, understanding that you can't size up a person from first impressions. Also, this current of thought is inseparable from art, especially Chinese painting and poetry, which give me great peace and spiritual harmony." Andrijauskas himself describes Daoism as the world view which is closest to his heart as a cult of nature and of roaming the limitless universe. I think by cult he means not any spiritual practice but rather a vibrant historical community of kindred spirits for whom life is a journey together. He does not submit himself to it, but rather, it is the worldview which suits him best. Andrijauskas was born in 1948 in Soviet-occupied Lithuania. As a boy, he loved the lakes and forests of the countryside. He was also exposed to artist Truikys's collection of Oriental antiquities and to the Hermitage in Leningrad where he saw works by the painter Guo1 Xi1. 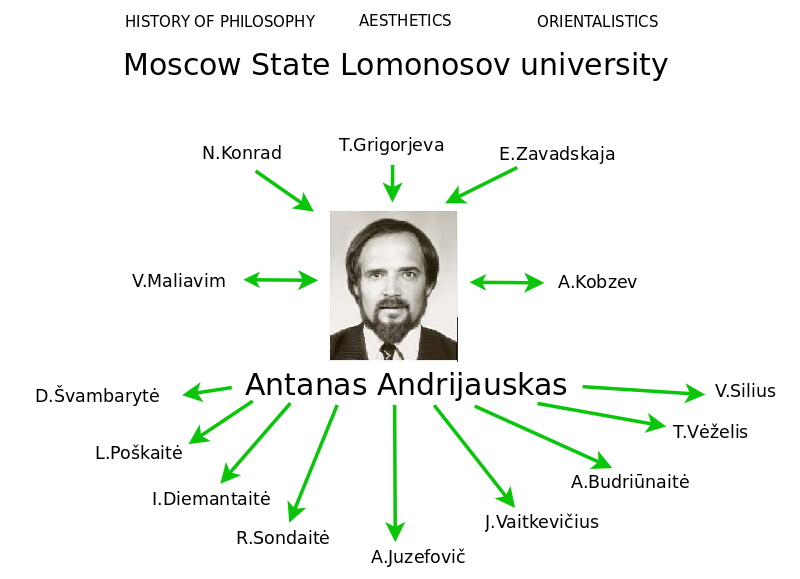 Andrijauskas's love of the East brought him to study history of philosophy, aesthetics and Orientalistics from 1968 to 1973 at the Moscow State Lomonosov university and also with French sinologists at Sorbonne. Back in Lithuania, he contributed to a growing interest in Oriental culture as an inspiration for Lithuanian national identity and an alternative to a grim, dreadful and amoral Soviet Marxist Communist reality. For 26 years he journeyed to Buryat near Lake Baikal on solitary fishing trips where he also met with local shamans and Buddhists. Buryat was a magnet for Lithuanian artists and intellectuals who could not venture outside the Soviet Union. 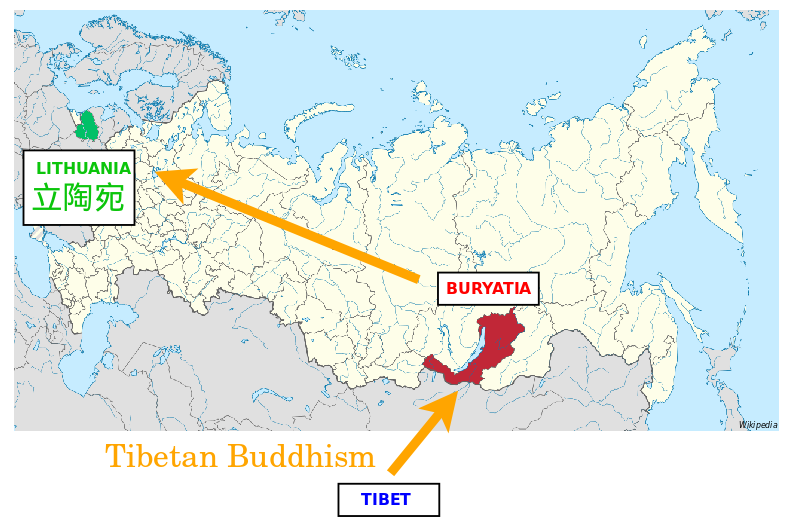 Tibetan Buddhism, practiced in Buryat, has since become central in the Lithuanian understanding of the East. Lithuanians, as a small nation and an occupied people, have great sympathy for Buryatians and Tibetans, who we feel we can identify with. Back in Lithuania, Andrijauskas was persecuted during the Andropov-Chernenko years for standing up for his likewise persecuted student Uzdavinys. Lithuania's nonviolent independence movement was inspired by Gandhi, Martin Luther King Jr. and the Daodejing. Subsequently, Andrijauskas nurtured all of the doctoral students who pursued Daoist topics. 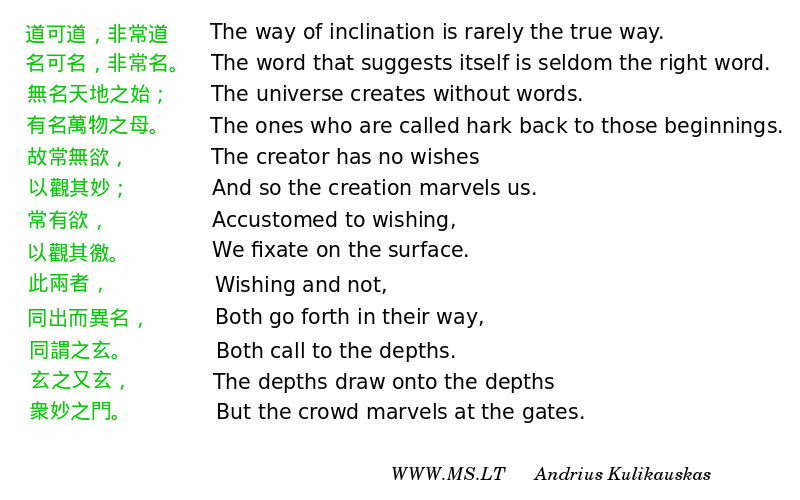 Andrijauskas is that rare person, like a Chinese hermit, who is a natural Daoist, and of whom it may be said, "The way of inclination is rarely the way." However, his life illustrates a much broader evolution which I may call the way of the independent thinker. I speak from twelve years of experience organizing independent thinkers and having conversations with thousands of them. Everybody thinks, but do we care about thinking? Do we cultivate our thinking? Independent thinking starts when we consciously choose one thought over another. If we choose a few thoughts every day, then in a year we have thousands of thoughts, or otherwise we don't. We develop projects and values to organize our thoughts. And ultimately we integrate all of our values, in our own personal way, with a deepest value that includes all the others. For example, my deepest value is "living by truth" but other such values include freedom, God, serving, learning, community and the Dao. This is what it means to know oneself. And then we can live in terms of the questions that we don't know the answer to, but would like to answer. We can work towards a culture of working on what we don't know rather than saying what we do know. But we should be careful not to be selfish in urging others to grow. Thus we find the relevance of a higher point of view such as God or the Dao which help us act selflessly. We can be helpful to all no matter where they are and we are on this way. We are inducted into this culture, this conspiracy of the Dao, this kingdom of heaven, when we appreciate that God doesn't have to be good, life doesn't have to be fair, the way doesn't have to be straight, so that we can learn forever, grow forever, live forever. Blessed are not the rich-in-spirit, who devote their lifetime, but rather blessed are the poor-in-spirit, the skeptical, who are willing to devote just a day for a cycle of independent learning: taking a stand, following through and reflecting. How can I learn in one day the essence of Confucianism or Daoism or Buddhism? I went to Qufu, the hometown of Confucius, and a Taiwanese gentleman Chien Feng taught me five of Confucius's sayings so that I could pass the exam and get free admission to the temple. Reading the sayings, they seemed banal, but memorizing them I realized they all probably have a double meaning, conservative and radical. Shi2-bu4-yu2, qin2-bu4-yan2. 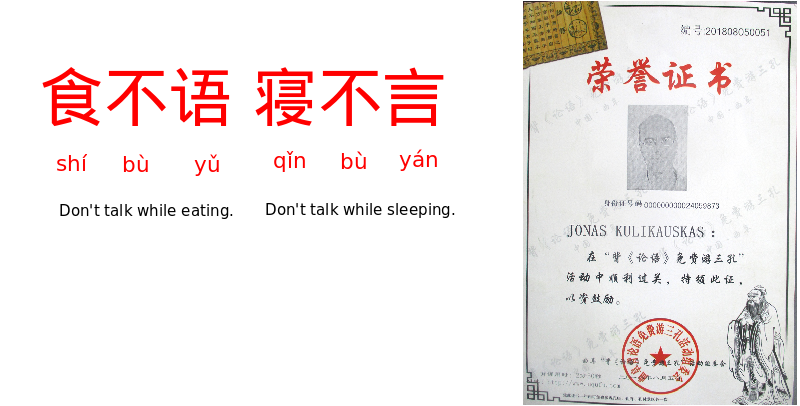 "Don't talk while eating, don't talk while sleeping." Radically, this means don't talk unless you can marshall all of your attention. "Don't talk while teaching, don't talk while presenting, don't talk while publishing." It's unlikely for an academic scholar like me to say anything wise to the extent that I am involved in academic matters. 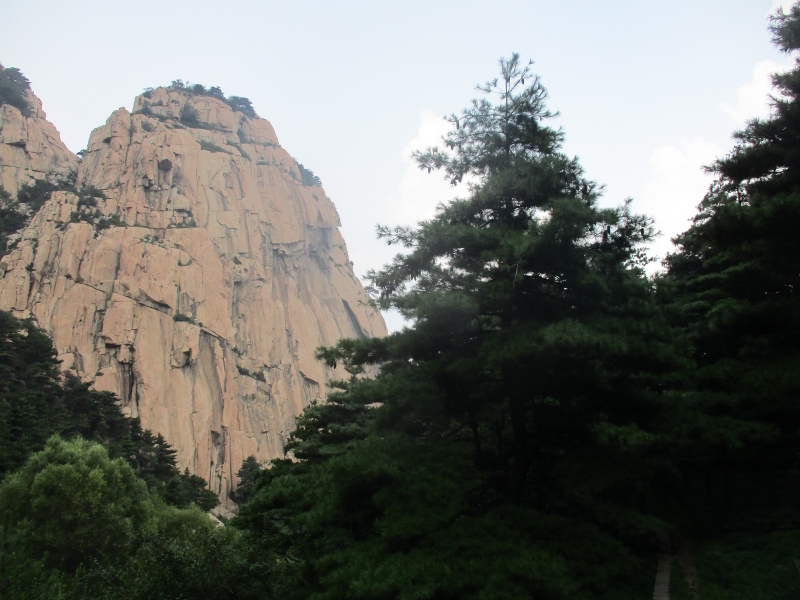 I spent a day climbing the holy mountain at Taishan to get an inkling of Daoism. I climbed alongside ten thousand people up the southern route. 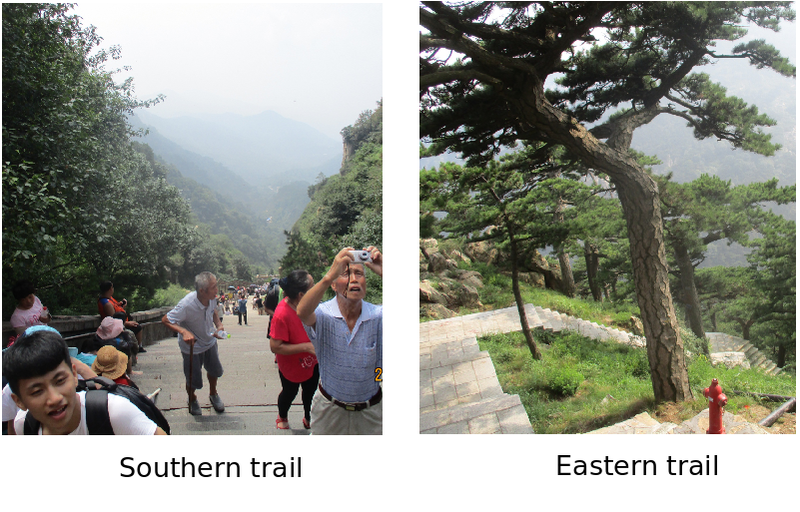 But on my way back, I chose the eastern route because I wanted to spend some time in nature. The stairs down were just as well kept but I saw only ten people in four hours as I went down. At the most magnificent location, which rivals California's Yosemite, I sat alone for twenty minutes, gazing at the landscape, as if I was a painter. The two-dimensional landscape became three-dimensional as I realized that the mountain was a puzzle of rocks wedged together. If I had drawn what I saw, then I would surely have grown even more sensitive. For me, this day illustrates and confirms the scarcity of independent thinkers in China, which is a riddle given this country's many achievements, the boundless construction, innovative technology, creative talent, and evidently prosperous, happy and well-behaved society. At the World Congress of Universal Logic, I did meet an independent thinker from China, but he agreed there were not many such in China, saying "I personally know them all." There is no civil society to speak of, there is no impulse to self-publish, and most people do not have a political faculty in their brain. People are focused on earning money and don't have a concept of "working for free". 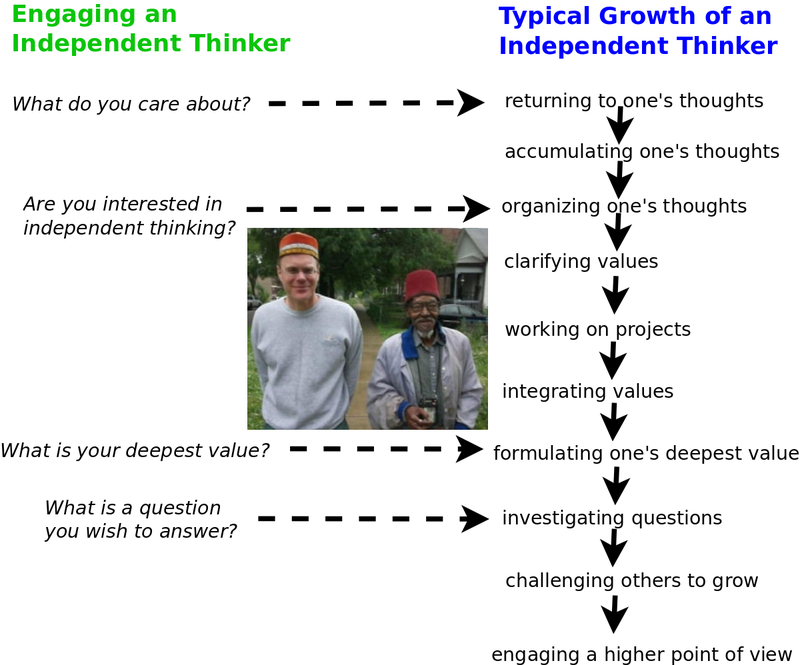 In the UK and the US, the volunteer rate is 60%, and I would estimate the number of independent thinkers is one-third of that, which is 20% or 1-in-5. The number of independent thinkers in Lithuanian cities is about 1-in-15, and in the countryside about 1-in-50. By these measures, in China, it is roughly 1-in-1,000. I was told that the Chinese aren't actually happy because they are always comparing themselves with others, which is not such of a problem for independent thinkers, who may not even seek happiness. I was also told that the Chinese feel very confused about matters of religion. This all makes me question whether China knows anything of the Dao, and whether the Dao can teach China anything. The architect Christopher Alexander has drawn inspiration from the Daodejing with concepts that are scientifically tangible. He investigates the question, What makes a building alive? And why do so many buildings built by professionals, including in modern China, make us feel dead? He notes that modern buildings are built from blueprints, designed off-site, whereas traditionally people built using patterns, resolving one problem at a time. For example, they would make sure that every room had light entering from two sides, and they would optimize the size of the windows as they built the building. A pattern language of hundreds of such decisions all supported a sense of peace, yielding a quality without a name - comfortable, exact, free, egoless, eternal, whole, alive. 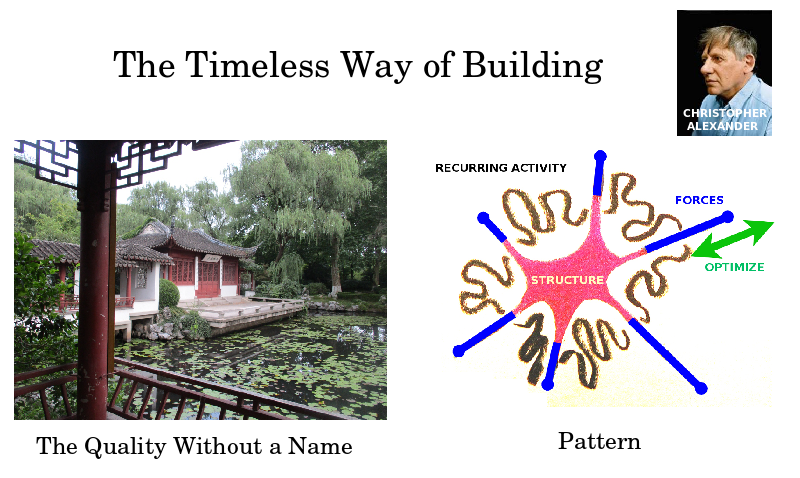 Metaphysically, Alexander's deepest insight is how recurring activity evokes structure, and structure channels activity, establishing a pattern. In Silicon Valley, the design patterns movement has been applying his ideas to large software projects to make them humanly possible. 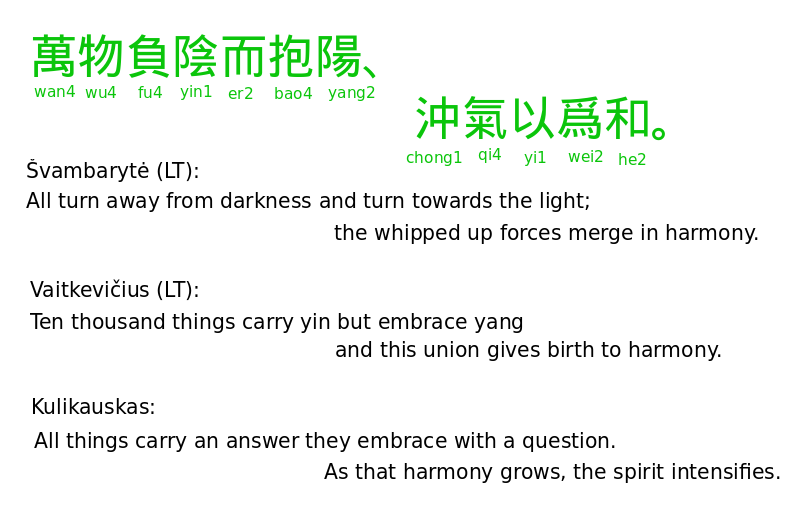 These are the kinds of practical concepts that I would like to understand the Daodejing in terms of when I hear that "The Way that can be followed is not the eternal Way. The name that can be named is not the eternal name." My wish is not to translate it into Lithuanian, but to translate it into a language of concepts. I have documented cognitive frameworks - divisions of everything - where such statements make sense. For example, in matters of existence, we always need two points of view. We need to be able to ask a question, Does this chair exist or not? in which case opposites coexist. But we also need to be accept an answer, If it exists, then it exists; if not, then not; in which case it is all the same. For participation we need three points of view, a learning cycle of taking a stand, following through, and reflecting. For knowledge we need four points of view: whether, what, how, why. Well then, everything itself can be taken as a onesome, its division into one point of view. Whereas the Dao may be identified with the nullsome, where there are no points of view. 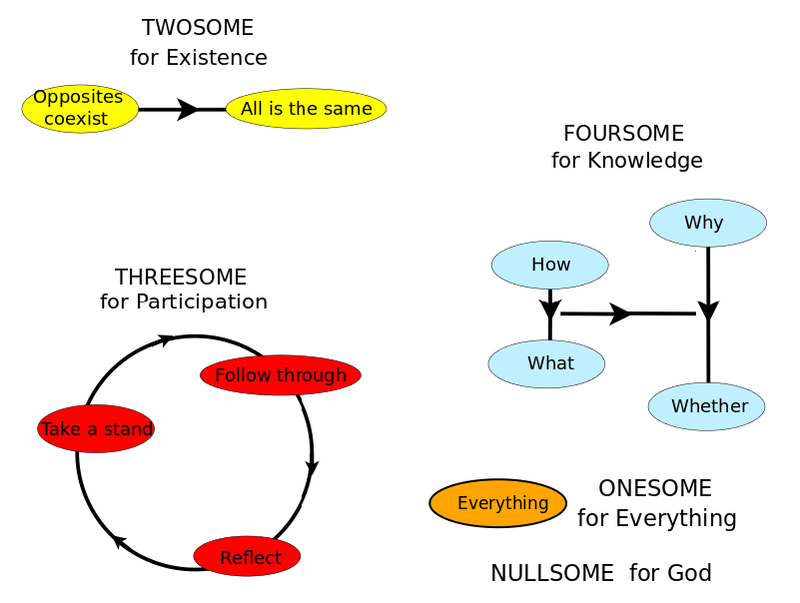 Such cognitive frameworks can be verified independently but may also make sense of the distinctions that the Daodejing makes between the nullsome and the onesome or, for example, when it teaches, "The Way produces one, one produces two. The two produce the three and the three produce all things." Lithuanian translations by Dalia Švambarytė, who took a poetic approach, and Julius Vaitkevičius, in a scholarly vein, I think fall short without such an independent conceptual framework. I will point out that Lithuanian is an ancient Indoeuropean language which evidently has preserved in its root system a philosophical system of inversions. The word for "road" or "way" is kelias, which derives from the verbs "kelti" (to raise) and "kilti" (to rise), and so the way is that which carries us that we may rise. 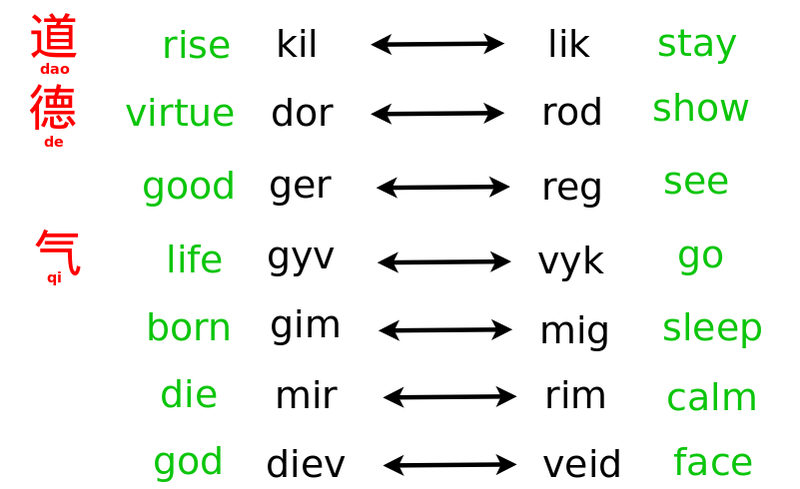 If we invert the root "kil", then we magically get "lik", which is to stay "likti", to hold "laikyti", and that which is held, "laikas", namely "time". Thus we seem to have ancient pairs: virtue vs. show, good vs. see, live vs. go, be born vs. fall asleep, die vs. calm down, God vs. face. Švambarytė wishes to convey the poetry of the Daodejing. Translating from Lithuanian back into English, we have: "All turn away from darkness and turn towards the light; the whipped up forces merge in harmony." Translating Vaitkevičius's scholarly rendering yields: "Ten thousand things carry yin but embrace yang and this union gives birth to harmony." However, let us imagine a primordial spirit, all alone, selfless. What could possibly come from it? It must remove itself by going beyond itself into itself, thus creating itself. This is the way. God is that spirit, Everything is God's self, and the Dao is God's way, his going beyond himself. The spirit grows in intensity. In the many things that arise, I think of the yin as the semantic mind that intuitively knows an answer and yang as the syntactic mind that explicitly asks a question. With all this in mind, I translate the passage: "All things carry an answer they embrace with a question. As that harmony grows, the spirit intensifies." The way of inclination is rarely the true way. The word that suggests itself is seldom the right word. The universe creates without words. The ones who are called hark back to those beginnings. And so the creation marvels us. We fixate on the surface. Both call to the depths. But the crowd marvels at the gates. Thus we are left to teach ourselves the Daodejing by what we know of the ways of our own lives. Yet we may have a cult, as professor Andrijauskas calls it, for a culture of many streams of thought, as his student Vėželis calls them, for a profound fellowship with the Way and on our way of independent thinking.